Patio heaters allow you to extend your outdoor lifestyle into the cooler times of the year. Once used primarily for the outdoor eating areas of restaurants, they are increasingly common as an amenity for backyard decks, patios and outdoor kitchens. Patio heaters are designed to take the chill out of the air over a small area, so you can sit comfortably outdoors in brisk weather. They can warm the air up to 20 degrees above ambient temperatures, but only for for a short distance in any given direction. There are options for various power sources, such as electricity (often referred to as infrared heaters), propane, and natural gas. Infrared heaters utilize special bulbs that emit a spectrum of light that causes anything it shines on to warm up. If it's not shining directly on you, you won't feel anything from it, whereas gas/propane heaters use a flame that heats the air, which then circulates throughout the space, heating whatever is in it. 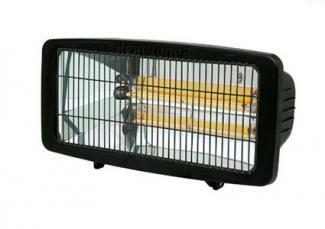 Propane heaters are a popular choice as they are self-sufficient with their own refillable tanks. Natural gas and electrical heaters, in contrast, require an electrical socket or gas connection to run them. 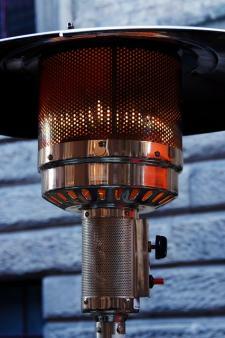 Propane and gas heaters generally put out the most heat, but generally cost more to operate than electric heaters. When shopping for natural gas or propane heaters, always look at its BTU rating - the measure of heat that it puts out - to compare among the options. For electric heaters, check the number of watts it's rated for to get an idea of heat output. 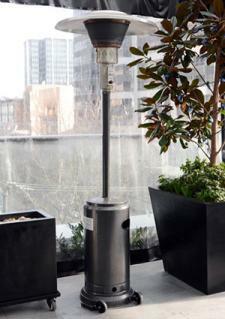 Patio heaters are divided up based on how they are mounted and used. These are usually about seven feet tall with a broad cylindrical base that keeps them from toppling over. They have a cap on top that directs the heat downwards. Propane and natural gas models are widely available though there are a few electrical versions on the market as well. Fire Sense makes a commercial quality heater that puts out an ice-melting 47,000 BTUs with LP gas, available at Sears for around $270. 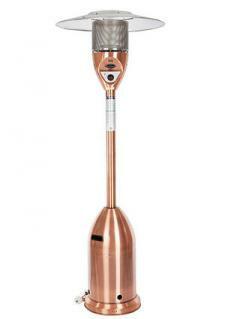 It has a gorgeous copper finish and receives good reviews from customers on Yahoo's shopping channel. AZ Patio makes an affordable natural gas model with a respectable 41,000 BTU output, available at Overstock.com for under $200. It's a lot of heat for the money and its stainless steel finish is suitable for all-weather applications. For an electrical free-standing heater, try the 1500-watt model from Well Traveled, available at Brookstone for about $300. It features a telescoping neck so you can adjust it to blast the heat right where you want it. These are smaller units that can be mounted on a wall or other overhead structure, such as a pergola or inside a gazebo. Propane, electric and natural gas models are available. Designer's Edge makes a 1200-watt infrared wall-mounted model, available on Amazon.com for $150. It radiates heat up to eight feet away, but only takes up 20 inches of space on the wall. EnerG+ makes a 1500-watt hanging infrared heater, available at Wayfair for under $150. Highly practical, it doubles as a light fixture with a built-in LED bulb. As the name implies, this version is small enough to sit on a table. Most are electric, but there are options that use miniature propane tanks. Crosley makes a simple, but elegant electric tabletop heater, available at Grandin Road for $250. This model has three heat settings, ranging from 700 to 1500 BTUs, which allows you to save energy when you just need a bit of extra warmth. Lava Heat makes an appealing propane-powered model with a pyramidal shape, available at HomeClick for around $250. Its 11,000 BTUs are top-of-class for a tabletop heater and it comes with a three-year extended warranty should anything go wrong. AZ makes a unique electric heater that is integrated with a parasol that fits in the center of outdoor tables, available at Hayneedle for $125. This approach allows you to sit close to the heat source without it cluttering the center of the table. 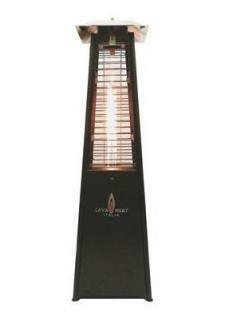 Patio heaters allow you to have the comfort of the indoors while enjoying the fresh air and ambiance of the outdoors. They don't put out enough heat for winter time use, but they are perfect for outdoor dining or stargazing on cool autumn evenings.